We all know that involving our kids in team sports helps keep them physically fit—but what about the mental health benefits? Team sports and dance classes are just as much about communication as they are about fitness. These families demonstrate how their kids’ growth in self-esteem and self-confidence may outweigh the physical benefits. Luke Christensen, with the help of his buddy Steve, has just had a great hit and he is rounding the bases for home. He checks the crowd clapping for him and smiles. Mom Vicki says this year Luke has really started noticing the crowd. Reflects Vicki, “It’s like [Luke is thinking] ‘everyone is clapping for me right now,’ and that’s cool!” Luke was never one to strive to be the center of attention. However, as Luke has become a stronger player, he is more apt to look back and acknowledge the clapping and praise for him. He takes pride in playing and the recognition for doing a great job. Luke is part of a Miracle League team that plays at Green Field in Coronado. 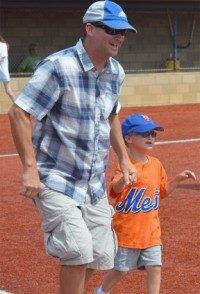 The league focuses on helping children with disabilities feel success while playing organized baseball. There are only two innings, and every game ends in a tie. Miracle League pairs each child with a buddy. Buddies come from a wide range of settings: from family members, to service groups to local college and high school sports teams. Program Director Gianna Stone says parents are not discouraged from being buddies, but Miracle League really tries to let caregivers who are hands-on 24/7 have a break. “It’s one hour of their day where they can sit back and relax and cheer for their kid like everyone else does,” says Stone. Vicki feels this is something parents of children with special needs truly relish. They spend a huge portion of their lives teaching their child rules of play and turn-taking; and it’s nice to be able to watch their kids succeed without hovering over them like a helicopter. Vicki has watched Luke take on the new role of mentor. At his games, Luke gets to see friends other than his usual classmates and he’s developed a special relationship with some members of his team. He truly loves his friend Charlie and has begun to help in her Miracle League experience. Gaining enough confidence in what you do to feel you can help others is an important step in a child’s social growth and Luke’s interaction with Charlie shows he’s developing in an exciting new way. Chloe Kuhns is a 12-year-old whose disability includes some learning and communication delays. Mom Laura chose to homeschool Chloe rather than place her in an educational setting where other students have more significant disabilities. To balance Chloe’s need for social interaction, Laura involves her with the Blue Roses Girls and in dance class at InnerDancer Performing Arts. There, dance teachers can help her work on her physical growth while social butterfly Chloe encourages younger kids in rehearsals for an upcoming presentation of Cinderella. Chloe’s mild hypotonia (low muscle tone often causing reduced strength) means she has to take extra care with some movements, especially those involving her knees. Her dance classes are designed to safely get the most range of movement from her body while enjoying the ability to perform and feel admired. Laura loves the focus of Director Caroline Atkinson’s class. “The classes are all about yes, rather than no,” says Laura. 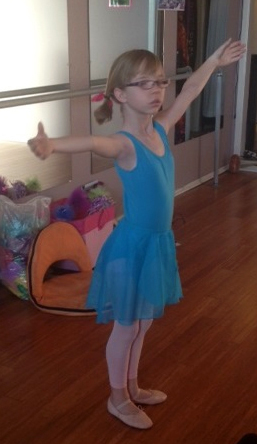 Chloe is encouraged to succeed at what she can do, rather than focusing on her deficits. Encouraging Chloe to foster success in younger students allows Chloe to blossom socially while she strengthens her muscles. Emma and Allison (Alli) Wells are sisters who share the same diagnosis, but could not be more different. Emma is a pleaser and generally happy to participate in any social situation. Her younger sister Alli is willful, strong and fiercely independent. Both girls participate in Miracle League and in the Sports for Exceptional Athletes (S4EA) bowling program. S4EA has a large number of seasonal programs that appeal to a wide range of abilities. 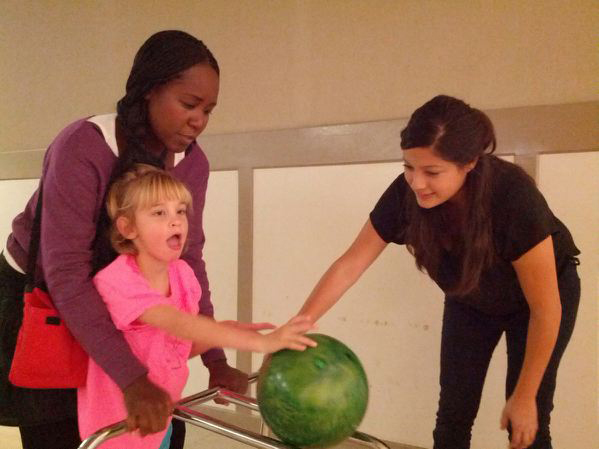 The bowling program, based at Kearny Mesa Bowl, uses bumpers to eliminate gutter balls and has specially designed chutes to allow Alli the opportunity to bowl independently. Mom Felicia stresses Alli wants to do as much as possible without help; and these special apparatus allow her to knock down pins by herself. Felicia confesses that Alli seems happiest when she is completely obliterating the pins at the end of the lane! The strong sense of being able to do something for yourself, the knowledge that you can succeed and the ability to mentor a peer are all great by-products of participating in sports and dance teams. For an opportunity to foster these traits in your child, please visit the Recreation section in San Diego Family’s Flourishing Families issue. Emily Dolton is a local artist and mother of two boys, one with 22Q11.2 Deletion.